Galaxy house has officially announced launching a new smart phone. 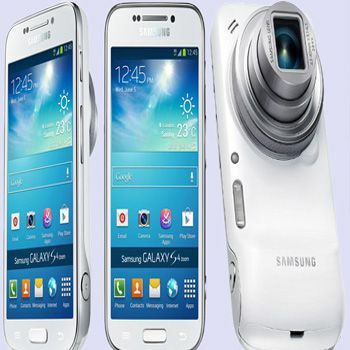 This is Samsung Galaxy S4 Zoom SM-C1010 which is aiming to replace your smart phone. With all its fascinating features and functions this smart phone is almost ready to hit the market and be in the hands of its all lovers. You can get this mobile as it is expected to be released in late June 2013. From its front it looks like Samsung Galaxy s4 mini and on the back, it’s a full fledge camera. It is Android OS v4.2.2 (jelly bean) supported mobile. This smart phone has 16 MP point and shoot with 10x optical zoom lens to bear. Enjoy the features of camera and smart phone in one deal as it is more concerned with high quality camera optics. This mobile is more than just a phone and has fascinating features of high quality camera optics. On the front side it sports a 4.3-inch qHD display, 1.5 GHz dual core processor. You can have such fascinating characteristics in beautifully designed handy device. You can enjoy a lot of things on your beautiful designed smart phone like play games, surf the net, share the data, send the picture messages, use social networks, send or receive short service messages, call, video, chat documentation. You can recharge your battery with fun whenever you want. Listen to music of your choice either mp3 or mp4. Enjoy your favorite TV channels anywhere and anytime. Isn’t it entirely impressive? Samsung Galaxy S4 Zoom SM-C1010 also offers you great memory storage capacity. It comprises 1.5 GB RAM and 8GB of internal storage expanded via microSD slot. It also has a 2,330mAH battery. You can use a wide variety of applications like Google search, Gmail, YouTube, calendar, Google talk and Picasa. The camera includes optical image stabilization and a Xenon flash, along with a special Zoom Ring. It has 16 mega pixel sensor and 10X optical zoom which is really better than any other smart phone. It also sports an optical image stabilizer (OIS) and Samsung’s smart mode which automatically chooses the best settings for your photos. This device appears to be very thick with an extremely large lens enclosure. For the people who want to capture high quality images and share them with others but don’t want to carry two devices at a time, Samsung galaxy S4 SM-C1010 is the best option for them as this handy device is easy to carry. This Samsung Galaxy S4 SM-C1010 is expected to be release in the late June. Samsung always brings a new and unique device for its customers and Samsung Galaxy S4 zoom SM-C1010 might fulfill the promise of bringing the best thing to this world and expectations with Samsung Galaxy s4 Zoom are very high. It’s s new and stylish heritage of Samsung galaxy house. Samsung Galaxy s4 zoom SM-C 1010 is a real smart phone with combining features of a beautifully designed mobile plus camera. Sunscreen: Are You Really Covered? Giveaway: Bloggers Love to Shop!! !